Businesses can help stop the cycle of malnutrition by providing support for healthy diets and breastfeeding to their female employees. This piece originally appeared in The Guardian. What if nutrition efforts focused on the places where large populations of teenage girls and young women are most likely to congregate – their workplaces? As more and more young women stream into labour market in countries with the greatest nutrition challenges, there is an opportunity to reach hundreds of millions of women with education about nutrition. And better still, there is a chance to improve their diets by providing nutritious foods at work. Traditionally, the route to reaching pregnant women has been through the health sector, which has usually meant waiting until a woman shows up at a clinic and struggles to deliver her baby, or returns later with a baby so close to death that the facility responds to the emergency, and not always with success. Poor nutrition in pregnancy is contributing to the estimated 290,000 maternal deaths and 6.3m newborn deaths that occur globally each year, and to the estimated 160 million children who are stunted – a lifelong condition that causes physical and mental delays, depressed educational performance and earnings, and an increased risk of developing chronic diseases like hypertension, type 2 diabetes, and cardiovascular disease. In Vietnam, the Alive & Thrive project has been working with local employer Canon since 2012 to support pregnant women and new mothers among its 24,000 employees. The benefits package encourages breastfeeding and good nutrition with an extra month of paid maternity leave prior to delivery in addition to the mandated six months after delivery, extra 15-minute work breaks for nursing mothers, breastfeeding facilities on site (a dedicated room with breast pumps, refrigeration, towel, steriliser and educational materials) and a $7.50 (£5) monthly allowance for employees with children under one year old. Alive & Thrive has increased the exclusive breast feeding rate from 19 to 63% in the project sites in just three years. Another project in Bangladesh is working with local employers to bring fortified foods and micronutrient supplements to 40,000 women garment workers alongside better prenatal care, breastfeeding support, childcare, water, sanitation and hygiene in the target factories. 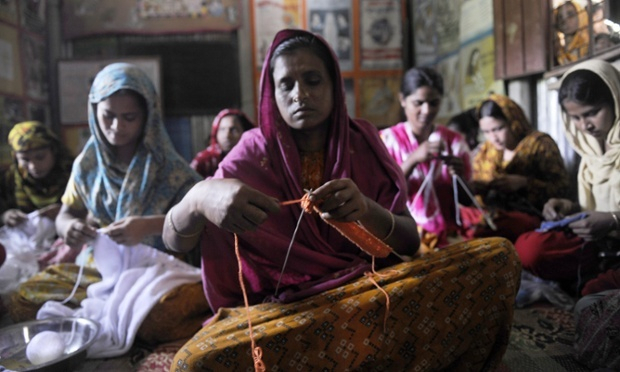 As a country with high female labour force participation (57%), with millions of women employed in garment factories in urban areas and 40% of women delivering their first babies before they turn 18, Bangladesh is an ideal candidate for work-based nutrition and breastfeeding support programmes that improve the health of young mothers. We need to see many more programmes like these in other countries with large populations of poorly nourished women, including India, China, Pakistan, Indonesia, Ethiopia, Nigeria, the Philippines, and the Democratic Republic of Congo. The Scaling Up Nutrition (SUN) movement is focusing on encouraging large-scale employers to make commitments to workplace nutrition programmes that target maternal health and support for breastfeeding mothers. More than half of the 51 companies that have signed up to the SUN movement’s business network have made such commitments. To guide them, SUN has produced a toolkit which lays out the basics of an effective workplace nutrition policy including improved maternity leave, breastfeeding support and vitamin-fortified (especially iron and calcium) high-protein, energy foods in workplace kitchens and canteens. Ultimately it is the largest employers of women of reproductive age in the countries with the worst nutrition performance that can have the greatest impact on reducing nutrition-related deaths and disability among women and children. Those employers have the power to stop the vicious cycle of malnourished young women giving birth to low birth weight babies who become stunted children, grow up to be malnourished teens, giving birth to low birth weight babies. The stakes are high enough to warrant some bold and large scale investments.